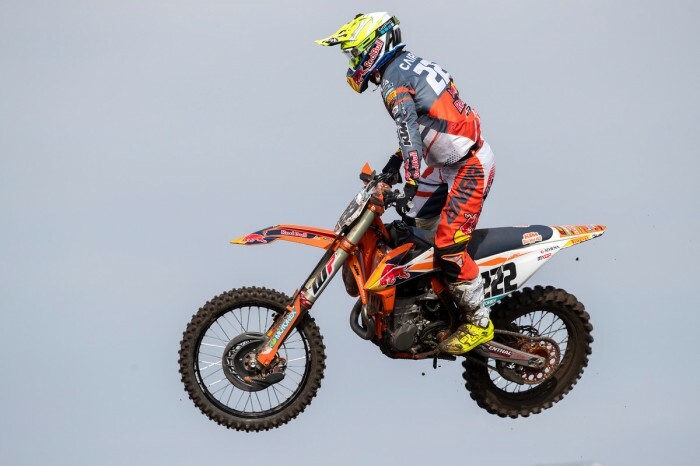 The FIM Motocross World Championship heads south this weekend for round three at Redsand MX Park in Spain where, after last weekend’s sub-zero conditions in Holland, the riders will be looking forward to some warmer weather. Although the custom-built venue, around 160 miles down the Mediterranean coast from Barcelona, is new to the GP schedule it’s already very familiar to lots of top riders who’ve chosen to spend part of the winter there. So far the premier 450cc MXGP class has been a two-man battle between Red Bull KTM team-mates Jeffrey Herlings and defending champion Tony Cairoli. The young Dutchman is currently enjoying the upper hand with his 2-1-1-1 scores from the opening two rounds contrasting with the seasoned Sicilian’s 1-2-2-2 record and Herlings will be aiming to extend his six-point lead at the top. Following his great start to the season in Argentina, Belgium’s Clement Desalle lost ground last time out at Valkenswaard but the Monster Energy Kawasaki rider still holds third in the table, two points ahead of 2015 champion Romain Febvre on the Monster Energy Yamaha. In contrast to Desalle, Gautier Paulin was disappointing in the series opener but bounced back to third in Holland to move up to fifth in the standings and Rockstar Energy Husqvarna’s tall Frenchman is now just a point behind his compatriot in fifth. Of the other riders with realistic hopes of winning in Spain, Team HRC’s 2016 champion Tim Gajser is the pick of the bunch. The Slovenian, who was forced to miss round one through injury, showed good speed – if not endurance – at Valkenswaard. His tally of eight race wins last year was only bettered by Herlings and Cairoli and it’s a case of when, not if, he picks up another. With Bike It DRT Kawasaki’s Tommy Searle expected to be out for three weeks while his broken collarbone heals, UK hopes lie with three riders in MXGP. With ASA Hitachi KTM UK rider Graeme Irwin aiming to establish himself in the top 15, we have to look to Max Anstie on the Rockstar Energy Husqvarna and Wilvo Yamaha’s Shaun Simpson to push for podiums. Defending MX2 champion Pauls Jonass is unbeaten so far this season but the Latvian was pushed hard in Holland by his Red Bull KTM team-mate Jorge Prado who’ll have home support this weekend to give him an extra lift. Swift Swede Thomas Kjer Olsen is second in the points for Rockstar Energy Husqvarna after Prado’s misfortunes in Argentina. He’s reeled off 3-2-3-3 moto finishes so far this season but needs a bit of extra pace to go with his consistency. The only other rider to score a race podium so far this season is young Aussie Hunter Lawrence (114 Motorsports Geico Honda) who followed Jonass home in the first moto of the year and sits third in the standings, four points ahead of Prado. If they can get the starts then all three Brits in MX2 are capable of running at least top five, if not higher. Kemea Yamaha’s Ben Watson came within a point of a podium in Argentina, Irwin’s team-mate Conrad Mewse was fourth at Valkenswaard and F&H Kawasaki rider Adam Sterry can’t be ruled out. Redsand will host round two of the EMX300 series where GL12 Racing KTM’s Mike Kras and Brad Anderson on the Verde Substance KTM will be hoping to close down Greg Smets’ series lead. It will also mark the EMX250 opener where an astonishing 92 riders will try to qualify for 40 places for the points-paying races. Among them will be Kras’ team-mate James Dunn who drops down from the EMX300 class to keep the two-stroke flag flying in sea of four-strokes. Along with the raft of other UK riders entered, expect Steven Clarke to go well for Carglass Honda plus REVO Husqvarna UK’s Mel Pocock and Martin Barr, Josh Gilbert on a DTHORC Honda and Kiwi Josiah Natzke for the British-based Buildbase Honda team.